I personally love nail art and a lot of my blog has been dedicated to different nail art designs, as you can see. As much as I enjoy watching nail art videos people seem to generally make them so long and I find them quite boring and start skipping large sections just so I can see how the effects were achieved. That is why I have decided to start creating some short one minute manicure videos lasting, as the title implies, roughly one minute. Not showing 10 minutes of me painting simple layers of polish and which polishes I used but just how I actually achieved my results. 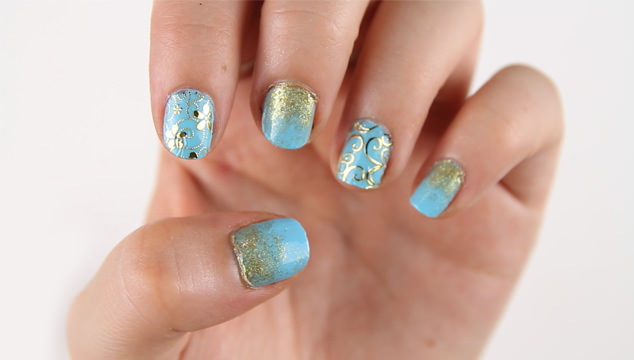 This is my first one minute manicure featuring blue and gold nails using an ombre gradient effect and nail stickers. Obviously videos can’t all be this short as some designs are more trickier or use more difficult techniques but let me know in the comments below your thoughts on this idea and video template. Do you prefer shorter or longer videos? I recently purchased the 108 3D Gold Flower Nail Art Decal Stickers from eBay and was really pleasantly surprised by their quality, given how cheap they were. With a top coat they have lasted me really well and look amazing, I’m definitely going to be ordering some more as they were so quick to apply. Be aware that they come from China so delivery times can be quite a wait. If you have enjoyed this video or would like to see more from me please subscribe to my YouTube channel and give the video a thumbs up!